The Lite Bluetooth Shell is a set of Delphi VCL-components for an easy management of serial Bluetooth connections. Lite Bluetooth Shell is the most easy way to to establish serial Bluetooth connections and manage Bluetooth devices programmatically. 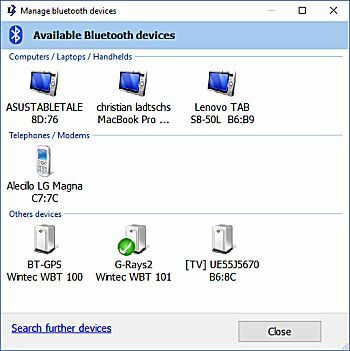 The management of Bluetooth devices under various Windows desktop and Windows tablet versions is always different. The user of your Delphi application is left alone with the establishment of a Bluetooth connection using the Windows Control Panel. This leads to unnecessary support and requires additional explanation away from your actual Delphi application. This is exactly where the "Shell" takes over. Apart from the actual Bluetooth connection - the shell provides an uniform GUI to select and manage Bluetooth devices programmatically under different Windows versions. The GUI is multilingual and supports actually English, German, French and Spanish . The GUI may displayed opionally in a Metropolis -Design for tablets, even using Delphi 7! If selected the device management and PIN request will appear in Metropolis design (full screen mode for tablets). 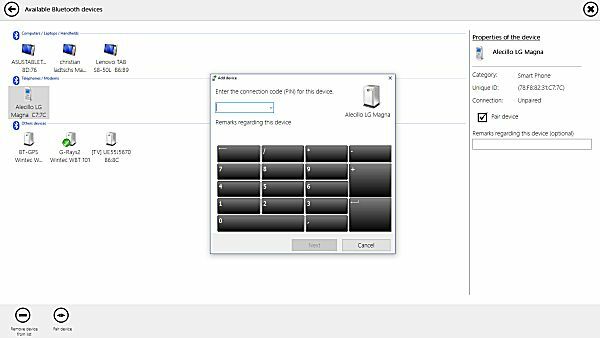 Especially on tablets under Windows 8 it is very tricky to handle the Windows specific device management on a touch screen cause of its tiny buttons. Der TLiteBluetoothManager provides a progammatic Bluetooth device management that you may integrate directly into you Delphi application. The user has no need to switch to the Windows Control Panel while workling with your application. The method ManageDevices calls the integrated Bluetooth device management. Depending on the settings in the TLiteCommunicationUI the management appears in a desktop or tablet design. The method SelectDevice serves to select a Bluetooth device programmatically. The use of different "profiles" allows to give the user a selection of only that devices he needs for a certain purpose, e.g. scanning. The method SelectedAddress provides the Bluetooth address of the most recently selected device of the current profile. The method DeviceName (Address) provides the user friendly name of the Bluetooth device that belongs to the given address. Ther TLiteBluetoothPort provides the serial connection to a Bluetooth device, reads and writes into/from this connection. The property Address sets the Bluetooth address of the desired device. The methods Connect established the connection with the Bluetooth device. The event OnNewLine is fired on each incoming data line. This event simplifies significantly the programming effort if it is sure (like for scanners and NMEA GPS devices) that the data comes in line by line. Apart from the above described key members furhter usefull poperties, methods and events are provided. Drop a TLiteCommunicationUI component on the form and specify the language of the user interface. Drop a TLiteBluetoothManager component on the form and call the method SelectDevice . Drop a TLiteBluetoothPort component on the form and assign in the event OnNewline how scanner data should be handled. Call the TLiteBluetoothPort method Connect to connect the device with the above selected Bluetooth address.